Turns out, Las Vegas is expensive. The first full day I was there I spent a good hour and a half looking for something, ANYTHING, to put in my face that was under 20 bucks. I finally found a $14.00 food court burger. It wasn't even an amazing food court burger. Le sigh. The day we arrived, Raed suggested that we try the Eiffel Tower Restaurant at the Paris Hotel. We took the roped off elevator up to the restaurant from the casino, and was greeted by a man in a tuxedo who's only job was to present you to the hostess. This, when you're a foodie, is a good sign. This, when you're on a budget, is a very bad sign. Nothing on the menu was under $40.00. Except the appetizers. They were around $20.00. It had been awhile since I had been to a traditional French restaurant. Actually, I hadn't been to a traditional French restaurant since I was in France, with my high school french club, something like 15 years ago. So, I decided if I was going to do this... I was going to DO THIS. Sorry about the picture. I got a little excited. Let me have a little conversation with you about Foie Gras. Have you ever eaten the stuff? Do you know what it is? Better if you don't know what it is. Put it in your mouth. I KNOW! IT'S THE BEST DUCK LIVER YOU'VE EVER PUT IN YOUR MOUTH! Seriously, though. When I was a kid, I referred to liver as "dirty meat." Which I guess is technically true of liver. It filters blood. Ew. What's up with that? Duck liver, however... oh duck liver. You are so magical. If you ever get the chance to try it, do. Don't fear it. I prefer it cold in a pate, but this restaurant served it warm and whole, with sauteed pears. I was very happy. 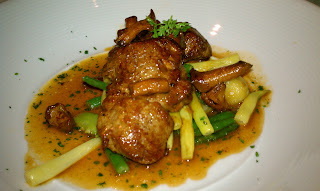 Having eaten a liver for starters, I ate veal for my main course. I'm not generally a veal eater... it freaks me out to think about the little cow. But I was in an expensive restaurant and I was channeling Anthony Bourdain. I was gonna eat that tiny cow! And I did. It was good... but now that I've actually had veal, I can have an opinion about it, and I prefer full grown cow. Tender? Sure... but so is a filet, and I don't have to feel like I stripped this animal's ability to chew cud for the next 5 or so years. It came with chanterelle mushrooms (at least 80% of the reason I ordered the dish), green beans, fava beans and tiny little potato balls in a light mustard sauce. Raed got the chicken. Lovely. In some sort of cream sauce with tiny, tiny baby onions made of complete joy. And baby greens. Tiny, little baby greens. So good. Our waiter, who insofar as I'm concerned would have been just as good at selling cars as he was at being a waiter, brought us the desert menu before we had even ordered the first course. He did this because if we ordered one of the souffles (of which there were 8 varieties), there was a 40 minute wait. 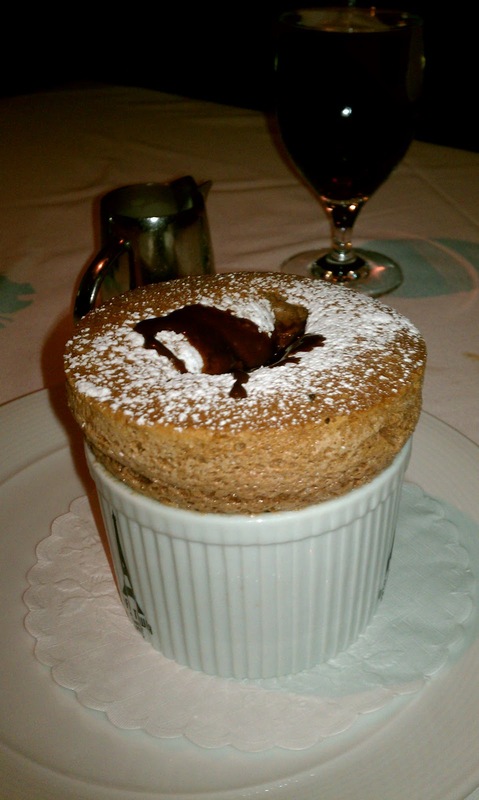 I had never had a souffle before...even having been to France. There was a brief puppy-dog eye session with Raed before we went for the classic chocolate. Highlight of the meal? Um, yeah. It came to us warm, with a very thin crust layer on top. The waiter put a hole in the top with a spoon and poured chocolate sauce in the middle. The resulting desert was fluffy and slightly pudding-like. It was like a cake +8 warm and gooey. I would eat one of these every day if they weren't damn near impossible to make in my apartment complex what with the neighbors fighting all day long. Also, if you've been paying any attention, the chance of me being able to successfully bake a souffle is somewhere up there with scientists finding a live unicorn in the Amazon. It's probably better that way. Hi again Lindsay. Posted a first comment but I am not sure it went through. 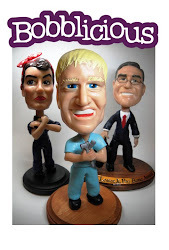 Raed made me discovered your blog. I love the way you write. No doubt, prices of food at Vegas are outrageous ! But so is evrything else in this weird city. Oh well. It's Vegas. Hi Anne! I'm glad you like the blog. So many food blogs are super dry or super lofty. I'm trying to stay away from that. Everyone is capable of making good food, culinary certificate or not. As far as Vegas is concerned, I never thought I'd say to myself, "I can't wait to get back to California where everything is cheap!" 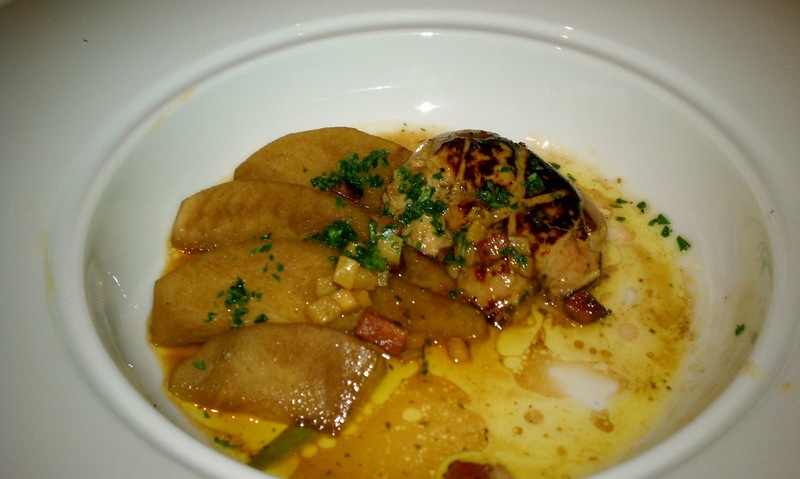 Foie Gras was one of the dishes I've always remembered from my time in France. I've been there twice and have a friend who lives in Paris. I adore it. I much prefer it as a pate, but I had never had it warm before.